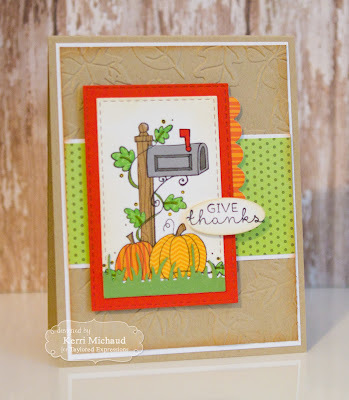 I chose to use this darling stamp-You've Got Mail-Fall for my card today. I stamped it with Memento Tuxedo Black onto some Sugar Cube cs, and then paper pieced it using TE Build a Scene dp and some TE Build a Scene Halloween dp. I also used some Earl Grey and Watermelon cs. I added the grass using the Wispy Grass Border Die and some Peapod cs. I cut the image out using the Stitched Rectangle Stacklets and popped it up using foam tape. The Toffee background was embossed with the Scattered Leaves Embossing Folder and the sentiment is from the Peek-a-Boo Pumpkins Stamp Set. Such a fun technique! That's it for me today:) Thanks for stopping by and enjoy your hump day! Great stamp choice for this technique! Love the papers you chose!